Being a great waiter or waitress requires certain skills such as multi-tasking and time-management along with the need to provide quality service to your customers. You may think that waiting on people would not earn you much, but you will be surprised to know that waiters in good restaurants earn reasonable amounts in tips, apart from their salaries. Knowing what the restaurant is serving is mandatory but look beyond the regular procedure by understanding the ingredients used in the dishes so you can easily recommend uncertain or diet conscience customers. Take help from the chefs at the start of your shift. Also make sure to know the ‘dish of the day’. Some of the customers will take time to decide what they are going to eat so make sure to go through the menu if required. However, pay attention when you are writing orders as any negligence will lead to embarrassment. Take your time and recheck the order. Make sure to do it only once. For a general rule, you must offer immediate drinks to all your customers. 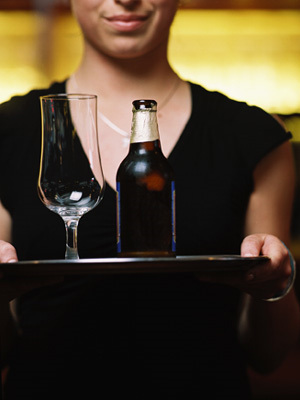 Anticipate whether the customer wants another drink while you are standing far away or taking another order. Responding quickly will allow you to earn larger tips. No customer likes waiting when no one is there to cater to him/her. If there is an unexpected delay, make sure to approach your guests and inform them about it. Serving complimentary starters is one way of pleasing the customer. If the customer wants to modify the meal, don’t simply say no. Try to accommodate his demands as it may be due to religious or cultural constraints. If the request cannot be catered to, apologize to the customer and tell him/her the reasons. Give alternate options if possible. Your customer’s mood will vary as some may have endured a bad day while others will be in a positive frame of mind. Reacting appropriately will be necessary for you. Always be polite and friendly and you never know the customer may become a regular. However, even though you know the customer doesn’t allow you to be over friendly. Gauge their mood first or simply, keep your distance. Don’t draw conclusions when the customer has finished his/her meal. Always ask whether they would like something else to eat - dessert etc. Make sure that you are not pushy. Hand the bill to them and stand away.